Hi all - My first post on this (or any!) forum, so hope I'm doing this right. Just picked up an older 'A' cat commercial Iver Johnson M1 - Jim from BavarianM1carbines.com tells me it is a 1979 model made shortly after IJ took over Plainfield. There are a couple of things that need attending to - the rear sight assembly looks like a non original replacement, and the lower receiver/trigger group casting has one of the front holes (that the pin securing the trigger group to the upper receiver goes through) broken off. If anyone has any great ideas where I might source parts this would be a great help. This is my first commercial M1 but not my first M1 (had a GM Inland) but I made the stupid mistake of selling that one some years ago to fund another purchase. Been kicking myself ever since!!! If anyone knows a source of or has a surplus 'A' cat mag too, could they sing out. Cheers! Welcome, and congrats on the Iver Johnson purchase. Sorry to hear about the Inland you sold, but hope it went to a good home. I am picking you are in NZ, was the IJ the one from Trademe recently? I have little knowledge of the IJ'S but I'm sure there will be someone who can recommend a source for the parts you need, are the mags interchangeable with the WW2 models? Hi - thanks for your welcome! Yes the Inland did go to a good home, it was one of those things when something had to be disposed of to "free up funds for another purchase" but you always end up regretting it afterwards. Yes I am in NZ and No - the IJ wasn't the one on Trade Me (although I did see that one advertised). The one I got came with a GI top wood fitted, but also had the ventilated hand guard and the original IJ Instruction pamphlet, sling & oiler with it. I bought it solely as a "shooter" as (correct me if I am wrong) IJ's and other commercial carbines aren't exactly "collectable" at this stage. I believe the IJ's are all built to the original GI specs and most parts are interchangeable with GI issue including the mags. 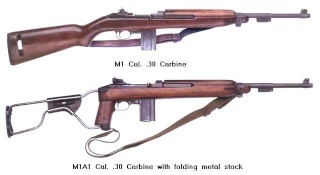 Good to hear the Inland is being looked after, as the M1 Carbine was popular with hunters at one stage, so there are a few that may have been less well treated than they should have been. On the collectibility of the IJ'S and other commercial models, I think they are more collectible than most realise, and will only become more so as time goes on. I sold the Inland together with mags, some loose ammo & reloading gear but must have had a secret desire to own another one as I did keep one full box of 50 PMC FMJ rounds for some reason! Hope to try the IJ out this weekend to see how it shoots. The previous owner obviously did shoot it as it had not been cleaned when I bought it and the carbon build up was quite impressive! A good soak in Hoppes No 9 did the trick! !